This is one of my favorite pictures from my wedding day. I have several but for some reason I love this one. Never mind the soap dispenser and the feminine hygiene product dispenser next to the paper towels. This was taken long before Photoshop and I could have edited it a bit before I posted it but I decided to just leave it alone. I was thinking about reflections the other day and this photo came to mind. I know I post a lot of selfies online and pose for a lot of silly pictures. It is kind of what I have done as a blogger. But when it actually comes down to looking at myself in the mirror many times a day –it just doesn’t happen. I never have perfect hair. I never seem to be able to achieve that flawless makeup look and when I was younger, as my mother can attest to, I wore way too much in an effort to make myself look prettier. But when I think about how often I actually look at myself and study my reflection each day it might surprise you. Oh I do the “check the hair and makeup” sweep by the mirror if I leave the house usually but I don’t even look in the mirror after I get ready for the day. But don’t we all wonder about our reflections at times? We go out into the world and live our lives and people see us and our reflections but do reflections really tell the whole story? The young mother who totes her kids from activity to activity buzzes like a social butterfly and yet has no one she can call when she just needs to talk to a friend. The well dressed business man who works insane hours and manages other peoples’ finances is living paycheck to paycheck fearing that bankruptcy is just around the corner. Reflections are all we see on the surface whether it is a mirror reflection or a face to face encounter but often it is not a true reflection of that person. That is perhaps why that old adage “don’t judge a book by its cover” is so appropriate. Today I am going to take a risk. I am going to step out of the reflection and try to see beyond. I choose to look deeper. To engage. To be responsive. What about you? I have very few pictures of the past. I am very fortunate that my parents took quite a few pictures for it being the time that it was — before cell phones and digital photography. I love being able to look back at them and am so grateful that we have them to look at. Thanks for stopping by! You look adorable in this picture. We don´t really see what others do, do we. I was shopping one day, feeling hot, tired and unattractive. I walked into a store and smiled at a woman at the back. She had a nice warm smile that made me feel good. It was only when I got to the back of the store I realized it was a mirror and I was smiling at myself!! That is an amazing story!!! I love it and yes—you have an amazing smile. that is one thing that I have always noticed in your pictures. You have a genuine warm and lovely smile –not forced but truly natural and that is the best kind. Thanks for sharing that wonderful story. I will be smiling all day thinking about it. I´m glad it made you smile. I felt rather foolish when I realized what I had done. My hubby also had a chuckle when I told him. What great pictures and reflections! http://www.segmation.com/blog. I love this post! I think it’s a fantastic reminder that we all need to remember that what we see on the outside is not always what is on the inside. You were a beautiful bride and I love you just as much now! You are so sweet. Thank you. I need to be reminded so often that appearances are not as they always seem. There is so much going on in the world that passes me by and I want to try to open my eyes just a little wider. You were a beautiful bride. Love the dress! Didn’t notice the soap dispenser and rest till you mentioned them. I agree, I am always surprised by what I really look like when I see myself in pictures. I don’t think I look at the mirror at all now that I’m retired. Thanks so much! The dress was my mother in law’s so that was really special that she asked me if I wanted to wear it. I don’t think people expect/want an honest answer. If they did, they wouldn’t surface/rote ask. Now you, you have the ability to listen. That is something we all need to do more of–listen. Thank you, Priscilla! I appreciate you stopping by. Ah…I hope they were all good memories. I don’t think we ever really get to know that many people in our lives. Reflections are powerful and so many of us cling to them and rarely show what’s inside. I think there are a lot of people that keep a great deal of themselves very guarded and sheltered. Sometimes it is to help us stay safe, I think. I love this! I was that kid and young adult that appeared to have it together and was dying inside. I longed for someone to look deeper. I think this is huge. Thank you. I think we all struggle inside so much more than the surface shows and it takes a lot of trust to let that out. I am glad you liked it. What a good blog. and I know you well enough to know you mean what you wrote. At one time or another, we have all been guilty of “judging that book by its cover” but as I get older I find I am less likely to do this. Why, I’m not sure. Is it because I am aging and therefore wiser or because life has taught me that what we see isn’t always what we get. I see that picture of you in the mirror on your wedding day and I have one very similar taken on the day I said “I do”. This past 6 weeks have been a huge reflection for me, and so sad. I have lost three precious aunts that had such a large impact on my life and stepped in and filled the void that was left when my Mom passed away. 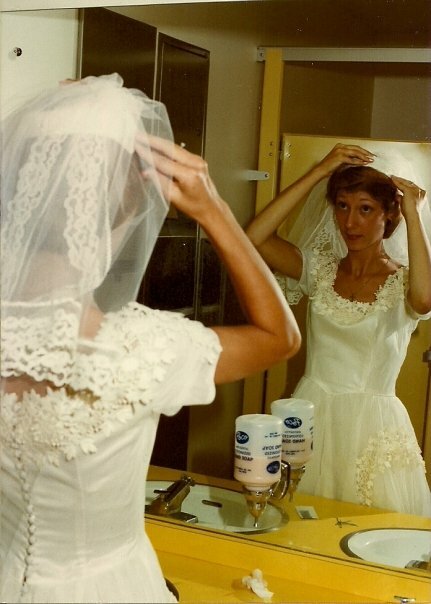 I can look in the mirror and see my sad face or I can look and see my aunts standing behind me on my wedding day, smiling. Where would life be, after all, without memories or reflections? So, I thank you for sharing. Blessings! When Cole was in school I was the photographer of choice because I learned what kind of pictures the girls hated (the boys cared far less) and rather than lecture them on accepting themselves I promised to never post an unflattering picture. And to check if I wasn’t sure. And I fixed pictures that I knew they thought would make them look fat. Thighs in volleyball shorts look fat in an unattractive way. As a result they seldom paid attention when I was snapping and I caught some amazing moments. Nothing beats the impromptu shot. Even if you hadn’t told us I would have known the picture above was special. I admire your ability to post selfies and current pictures. Funny thing is I hate, hate having my picture taken. I’ve taken and posted one selfie ever. Would I like to take more–you betcha. But I really do look awful in pictures, probably, because I am way too self conscious. Even my Mom says the camera isn’t my friend. Cole agrees. A friend promised to teach me how to look better in pictures. Truth–I’ve always wondered how I would tell you I wouldn’t take a selfie with you :-D.
I guess, this is not an uncommon trait of photographers but I can only claim to be a very ameteur photographer—so I’ll have to give up that excuse and work on it. Reflections. A careful look back at past pictures can tell you a lot about who a person is or will be. On Joe’s and my first date someone (oh god) took a picture of us. We hated one another and never planned to see each other again. The most prominent thing in the background of that picture was a baby carrier. 😀 I agree that the pull together, professional pictures tells us far less about who a person really is. I love this comment, Katybeth, because now I know so much more about you. And if you know me at all you know that I would respect your wishes to not be in a selfie with me. Isn’t that funny that you thought about it? My pictures are almost always crazy haired and not what I would call beautiful but it is me–real life—always imperfect and that is what I am. I know I do a lot of selfies (even just hired a Fiverr to make a cartoon of one) but I was surrounded by people that promoted that for a couple of years so it wore off. I also am a firm believer in preserving memories with photographs so I make sure that family time includes a lot of photos. so there you have it. I love your reflections and love how comfortable you are in your own skin and yes—you are an amazing photographer and you bring out the best in all of your subjects–furry or human! Very reflective, a worthy read!